Please forgive me that this post is reading backwards. I am still trying to figure out all these new-fangled tools. A few friends of mine have been buying plants for their tanks, and I thought I would toss in my 2 cents worth. I have had a planted tank for about 3 years now maybe? It is a 29 gallon tank that I had traded a 20 gallon tank for. The 29 had split a seem, and I knew I could fix it. I did a lot of research on aquaculter when I set my newly repaired tank up. I have about 4 inches of substrate at the bottom of the tank. I know this is about 2 times what people suggest, but, hey, I got the 2 different sizes of rock on sale when I got the bigger bags. I mixed the 40 pounds of rock with a clay product called Laterite (sp?). The Laterite gives the plant roots something to cozy up to besides all that cold, hard rock. Actually, it provides the roots with a steady source of chiliated iron, which makes for healthy plants. I am also doing something new (for me) with the tank. I am treating the tank with a “black water” additive. I happen to really like the nice, warm feeling of my “dirty” tea colored water. It probably has something to do with working on the St. Croix River for many years. I am just fond of nice, clean, brown water. I think the fish look better in it. I think the plants grow better in it. 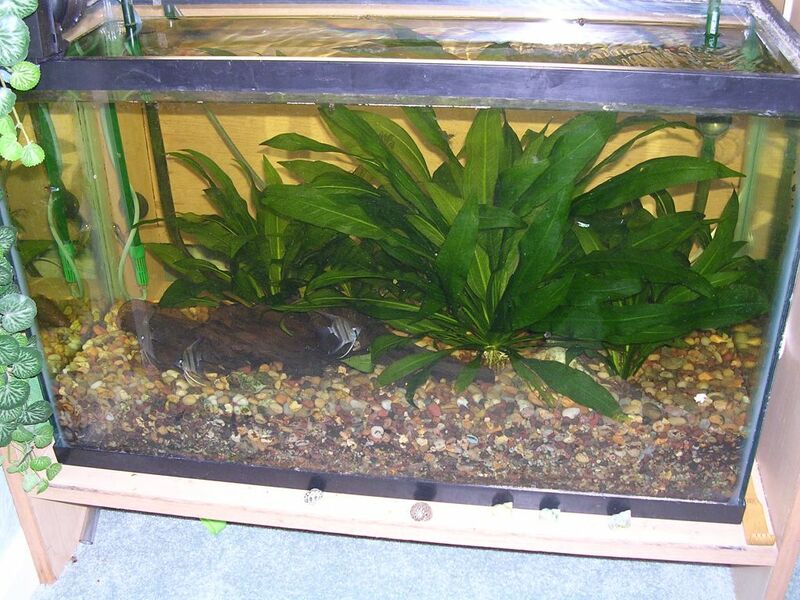 I think YOUR planted tank looks so…. Hospital Waiting Room, with it’s crystal clear water. Oh, speaking of crystal clear planted tank water, you don’t want to charcoal filter your planted tank. This removes all the nutrients and such that your plants need to stay healthy. The proof is in the pudding as they say. Here you can see the Amazon sword plant that I bought over 2 years ago (I think it now numbers 7 or 8). I have to trim back the plant every month or so or it completely dominates the tank. I have recently moved to a new place, and heavily pruned the plant back. I had taken the plant out and devided it. I then put all my new, little plants in a bucket. I moved the tank and left the bucket at the old place. The plants where NOT happy about spending 3 days in the bucket hotel. They died back about 50% after I got them into their new home. Another heavy pruning, a little TLC, and my CO2 injecting system has them in good health after a few months. Loving your Aquarium a little too much…. The more I clean, the messier it gets!